Although the biggest headline of the week was the appointment of a special counsel to investigate Trump-Russia, of equal importance was the diurnal harbingers of our fading democracy. Trump’s WH invitation to yet another brutal authoritarian: Erdogan of Turkey, and the ensuing melee outside the Turkish embassy in DC, is a wake-up call for us all. WSJ reported that three former employees of the Trump organization saw him tape phone calls from Trump Tower. Trump still has not revealed if his alleged taped conversations with Comey really exist. The Economist interviewed Trump about his economic policy, and described his strategy to be “unimaginative and incoherent.” The interview revealed alarming lack of knowledge of basic concepts. Merkel’s party seized a key state from rivals in the last election, putting her in a strong position for Germany’s general election in September. This would mark the fourth setback for Putin since Trump. An NBC poll found that just 29% approve of Trump firing Comey, and 78% want an outside special prosecutor. Trump spent Mother’s Day on the golf course, and did not see Melania or Barron. The Trump regime issued a statement on N. Korea’s missile test, which oddly started out with a Russian perspective. New York Magazine reported that candidates for FBI director were being screened for their loyalty to Trump. WAPO reported on the ways Trump has leveraged his presence at Mar-a-Lago to enhance his club’s event business and enrich himself. The Trump regime has hidden massive amounts of data on issues such as workplace violations, energy efficiency, and animal welfare abuses — lessening the “naming and shaming” effect on corporate behavior. Clapper said US institutions are under assault — both externally with Russian interference in our election system, and internally from Trump. Page wrote a bizarre letter to Rosenstein, complaining about Obama and Clinton, and citing Maroon 5 lyrics in the footnotes. A WAPO reporter noted “This Is Not Normal,” when the paper accidentally published Mattis’s personal cell phone number, which was on a yellow sticky note in a photo of Trump bodyguard Keith Schiller. Russian aluminum oligarch Deripaska is suing AP for libel in connection with their reporting on his ties to Manafort. Mother Jones reported that 50 farmworkers outside of Bakersfield, CA were poisoned by a pesticide just green-lighted by Trump’s EPA. Trump met with UAE crown prince Sheikh Mohammed at the WH Monday. In Week 21 it was noted that this crown prince brokered a meeting between Prince and a Putin ally in Seychelles, shortly after a clandestine US meeting with Kushner, Bannon, and Flynn. On Monday, WAPO reported that Trump revealed highly classified information on ISIS to Lavrov and Kislyak at the WH meeting. As mentioned in Week 26, US media was excluded. Reuters and NYT also confirmed the story, with NYT adding the leaked information came from an ally. The WH continued to deny the WAPO story Monday night. At a press conference Tuesday, McMaster claimed that Trump decided to leak highly classified info to the Russians on the spur of moment, and wasn’t aware where the information came from. ABC reported Trump’s leak endangered an Israeli spy placed inside ISIS. WSJ reported that the Israeli source Trump leaked was considered so sensitive, it wasn’t shared with Five Eyes, our closest allies. For the first time, more Americans support Trump’s impeachment (48%) than oppose it (41%) according to Public Policy Polling. Their polling was conducted before the Russia leak. Trump hosted Turkey’s Erdogan at the WH, another in a string of brutal authoritarians invited to the WH despite human rights abuses at home. 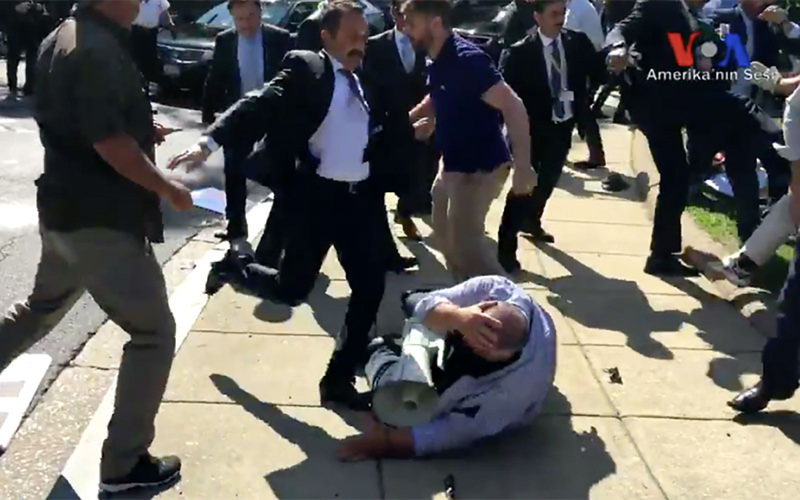 After the meeting, a video captured Erdogan’s bodyguards viciously attacking protesters outside the Turkish embassy in DC. Later, a video surfaced of Erdogan watching as his guards beat protesters. DC police chief Peter Newsham said diplomatic immunity could limit what the city can do to hold Erdogan’s bodyguards accountable. Republicans and Democrats spoke out against the attack, with McCain calling for Turkey’s ambassador to be expelled. Ceren Borazan tweeted a photo (see below) and wrote: “Dear @POTUS I’m being attackd [sic] in this photo. I was assaulted by this man, strangled for protesting. Please help me find & prosecute this man.” The tweet was retweeted over 55k times. Trump has not responded to the assaults. Following outcry, the State Dept summoned the Turkish ambassador; but two bodyguards who were detained, we released and allowed to leave without redress. The @VP account tweeted then deleted a photo of Trump and Erdogan’s sons in law — both in government positions of power — seated across from one another at lunch. NYT reported that Comey had been writing memos on his interactions with Trump, including a February 14 meeting at which Trump asked Comey to end the FBI investigation of Flynn. NYT also reported that the meeting took place in the Oval Office, and before it started, Trump asked Sessions and Pence to leave the room. According to a Comey associate, Trump also told Comey he should consider putting reporters in prison for publishing classified information. WAPO reported Comey had shared his notes with a small circle in the FBI and DOJ — raising questions of whether Sessions and Rosenstein were aware before they wrote the memo to back Trump’s firing of Comey. That evening, and the following morning, TV networks — including Fox News — complained that elected Republicans were refusing to go on-air. Wednesday morning, Putin offered to hand over records of Trump and Lavrov’s conversation to the US House and Senate. NBC reported Feds have subpoenaed Manafort for a $3.5 million mortgage taken out on his Hampton home just after leaving the Trump campaign. Mortgage documents were never filed, and taxes never paid on the loan. Eleven Democratic Senators called for an investigation of Sessions’ involvement with the Comey firing, after his stated recusal from the Trump-Russia investigation. In another sign of US decline under Trump, France’s PM, economic minister, and national security adviser are all experts on Germany. 27-year-old Jean Jimenez-Joseph became the seventh person this year to die while under ICE custody. Jimenez-Joseph committed suicide, but ICE said he “passed away” while at a detention center. ICE data revealed 41,000 arrests in Trump’s first 100 days, a 38% increase over the same period in 2016. As crises loom this week, a new NBC/WSJ poll found that only a quarter of Americans find Trump to be honest. WSJ reported Russian state-run bank VEB indirectly provided hundreds of millions in financing to Ukrainian steel mill owned by Alexander Shnaider, who then funded construction of a Trump project in Toronto. On Wednesday, Rosenstein appointed a special counsel, Robert Mueller, to oversee the federal investigation into Russian interference in the 2016 election and possible collusion between Russia and the Trump regime. Rosenstein was set to appear before the full Senate on Thursday and House on Friday. The WH was blinded by the special counsel news: given only 30 minutes advanced notice. WH PR strategy was in chaos, with Conway cancelling a scheduled appearance on Tucker Carlson’s show an hour before airtime. No members of Trump’s inner circle appeared on TV Wednesday. Some GOP leaders laughed, and McCarthy continued, “Swear to God.” Speaker Ryan swore the attendees to secrecy. When called for comment, spokespeople for Ryan and McCarthy denied the WAPO story — until the Post told them they had audio. Pence registered a PAC on Wednesday, typically a signal of seeking higher office. Neither Biden or Cheney had active PACs while in office. NYT reported that Flynn officially disclosed to the Trump transition team on January 4 that he was under federal investigation for secretly working as a paid lobbying for Turkey. Pence headed Trump’s transition team, but he continued to deny he knew about Flynn’s lobbying. Pence was also notified about Flynn by Rep. Elijah Cummings in a letter dated November 18. NYT reported the Trump regime was aware of Flynn’s business dealings in early November, even before his infamous pro-Turkey op-ed on Nov 8. NYT also reported acting FBI director McCabe confirmed to Congress a “highly significant” investigation into possible collusion between the Trump regime and Russia to sway the 2016 election. FBI prosecutor Brandon Van Grack is leading a grand jury inquiry in VA looking into Flynn’s foreign lobbying, and has started issuing subpoenas. NBC reported that both Manafort and Flynn are considered “subjects” of a criminal investigation. Also per NBC: the FBI, with help from the Treasury Dept, CIA and other agencies, is examining contacts, money transfers and business relationships between the Trump regime and Russia. McClatchy reported that one of the Trump regime’s first foreign policy decisions, involving the fight against ISIS, was made by Flynn in coordination with outgoing NSA Susan Rice. Flynn went against Obama administration advice, and put Turkey’s interests ahead of US interests. Reuters reported that the Trump regime had at least 18 undisclosed contacts with Russian officials in the 7 months leading up to the election. Six of the undisclosed contacts involved Kislyak with Flynn and three other Trump regime members. The other 12 involved Russian officials or people close to Putin and Trump campaign advisers. Reuters also reported that after the election, Flynn and Kislyak had conversations about setting up a back-channel communication between Trump and Putin that could bypass the US national security bureaucracy. On Thursday, Flynn’s lawyer said his client will not honor the Senate Intel Committee’s subpoena. WH advisers and personal associates are urging Trump to hire an experienced outside attorney to deal with the Trump-Russia probe. TIME reported Russia tried to hack the Defense Dept’s Twitter accounts by sending 10,000+ tailored messages in an effort to get them to click, which would have enabled hackers to control the account. Thursday, Rep. Jason Chaffetz, the chair of the House Oversight Committee, resigned from Congress without explanation. Newsweek reported that Trump staffers are starting to look for new jobs, and are worried about the taint of having worked for the Trump regime. Thursday, Rosenstein briefed the Senate. McCaskill and other senators said shared that Rosenstein knew Comey was going to be fired before he wrote his memo. Thursday, Trump tweeted the Special Counsel/Russian is the “single greatest witch hunt of a politician,” and continued to cite Rosenstein’s memo as justification for his firing of Comey. NYT reported Trump called Comey weeks after taking office, and asked when he was planning to publicly state that Trump was not under investigation. Comey tried to explain proper chains of communication. According to a friend, Comey was troubled by many of his encounters with Trump, including a January 22 ceremony in the WH blue room, where Comey tried to blend in the blue curtains to avoid Trump’s attention. WAPO also reported on Comey’s apprehension around meetings with Trump, citing his extensive preparations with staff, and writing out notes in his car directly after meetings. NYT also reported Priebus asked Comey to push back on media reports in mid February that the Trump regime had been in contact with Russia during the election. Kushner, while in a WH room with a high-level delegation of Saudis, called the chief executive of Lockheed Martin, and asked if she would cut the price on a $100+ billion weapons deal with Saudi Arabia. CNN reported that despite his recusal, Devin Nunes continues to review intelligence relating to Russia, including as part of the Gang of Eight. Nunes had recused himself over his close ties to the Trump regime. Pence’s team continued to spin stories and distance him from Trump, indicating Pence was kept in the dark on Flynn and Russia, and that he’s a “loyal soldier” but the news cycle is wearing on him. In Trump’s first 119 days, he has made 586 false and misleading claims. As Trump floated Joe Lieberman as his top pick for FBI director, mysteriously Lieberman’s Wikipedia page was edited to remove “Donald Trump” as a notable client of his firm. On Friday, Rep. Carlos Curbelo became the first Republican to call for Trump’s impeachment. Stepping closer to obstruction of justice charges, Trump also allegedly told Russian officials that firing Comey had relieved “great pressure” on him, and that he is not under investigation. Reuters reported that the Trump regime is exploring ways to use obscure ethics rules to undermine the special counsel investigation of Trump-Russia — citing that since Kushner and Manafort were clients of Mueller’s former firm, Mueller should be barred from investigating them. Late Friday, New York Magazine reported the person of interest in the WAPO story is Kushner. CNN reported that intercepts of Russian communications reveal Russian officials bragged during the presidential campaign that they could use Flynn to influence Trump. Trump pick for deputy Treasury Secretary, James Donovan, withdrew from consideration on Friday. A former Trump campaign official who has hired counsel in the Russian probe told a CNN reporter that Trump should help pay for legal costs. As Trump left for his first foreign trip, one reporter noted, “Almost palpable relief the circus has left town for a few days.” Truly was a different feel from the not normal chaos of recent months.